My list differs in that I’m focused on books I actually read in 2017, not books released in 2017. I’ve got a variety of books in this list. It is not simply theology, Bible and ministry related. Perhaps there are some you will be prompted to read. I hope so, because you might benefit from them. So, here we go. Devoted to God: Blueprints for Sanctification by Sinclair Ferguson. This was probably the best book I read in 2017. Ferguson focuses on a series of texts that provide a framework for our sanctification. He does a great job of defining sanctification in terms of our devotion to God, and unpacking those texts. I highly recommend this book. From the Mouth of God: Trusting, Reading and Applying the Bible by Sinclair Ferguson. Yes, another book by Sinclair Ferguson. This is an updated version of one of his earliest book. He addresses the authority of the Bible and how to benefit from reading it. Both novices and experienced readers of the Bible can benefit from it. Luther on the Christian Life: Cross and Freedom by Carl Trueman. I’ve loved this series by Crossway. This is another impressive contribution by Trueman. He is not trying to repaint Luther to look like a 21st century evangelical. Luther places great stress on the Word of God in our worship and Christian living. It is an emphasis that should mark us more than it currently does. Calvin on the Christian Life: Glorifying and Enjoying God Forever by Michael Horton. This is another excellent volume in the series by Crossway. It is fairly theological, but not for theology’s sake. Like the Luther volume, we see the very different context in which the Christian live is lived. The church was close to the center of life for most people with services offered daily. Horton focuses on the story of redemption and how this shapes Calvin’s views. Not just a man of his times, Calvin was also a man ahead of his time. Faith Seeking Assurance by Anthony Burgess. This Burgess is the Puritan, not the author of A Clockwork Orange. The focus of the book is assurance of salvation. Assurance is viewed subjectively (Calvin tends to view it objectively- assurance God saves sinners), meaning that God has saved this particular sinner. He holds to the view expressed in the Westminster Standards. In my review I note that this is not a perfect book, but that it is a very good and worthwhile book. Keeping the Heart: How to Maintain Love for God by John Flavel. Another Puritan volume worth considering. It is not long but focuses on maintaining our love for God in a variety of difficult circumstances that Flavel lays out for us. He notes the particular temptation of each set of circumstances and provides means to help us maintain our love for God in them. This is a very good little book. Good and Angry: Redeeming Anger, Irritation, Complaining and Bitterness by David Powlison. This book is unusual in that it doesn’t frame anger as essentially wrong. He does address our anger problems, tying them back to what we love. Often our anger problems reveal love problems. This was a very helpful book. Making All Things New by David Powlison. This is a short book focused on God’s plan to restore our broken sexuality. He addresses both the sexual sinner and sexual victims though it is weighted toward the sinner. He is realistic as he views this within the framework of our sanctification. Though brief, it was helpful by providing an overview of God’s goals and purposes. 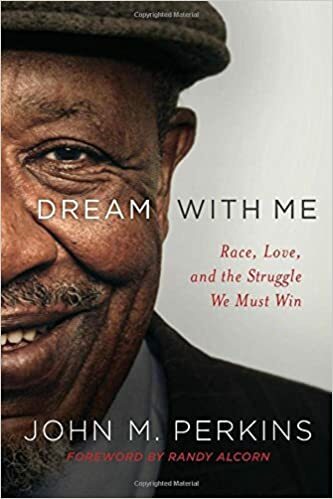 Dream with Me: Race, Love and the Struggle We Must Win by John Perkins. If you haven’t read any of John Perkins’ books before, this is a great place to begin. He is an activist for civil rights as viewed through the framework of the gospel. He sees Christ as the only real hope for racial reconciliation. The books is full of stories compiled according to the themes he explores. Union with Christ: The Way to Know and Enjoy God by Rankin Wilbourne. This is a very good and accessible book on the subject of union with Christ. It doesn’t address all that it could. What it does cover, it covers quite well. It is written for laypeople so you won’t get lost in abstraction or in over your head theologically. Getting the Gospel Right: The Tie that Binds Evangelicals Together by R.C. Sproul. I read the recently updated volume which was originally published in the 1990’s. Sproul examined and critiqued the controversial Gift of Salvation document which followed after Evangelicals and Catholics Together. Generally winsome and irenic, Sproul explores the reality of the communion of saints and its connection to the doctrine of justification. In the process, R.C. sheds light on a recent theological controversy as well as the one we call the Reformation. Rejoicing in Christ by Michael Reeves. I like Reeves’ books. He writes with a sense of humor, sense of history and wanting a doxological focus. This volume focuses on Christology and presents it in an interesting and accessible fashion. This is a very helpful book for laypeople wanting to understand Christology. Jonah (The Exegetical Commentary of the Old Testament) by Kevin Youngblood. This was my favorite commentary while preaching through Jonah this fall. It has a very good blend of exegesis and application. It strikes a very good balance. Knowledge of Hebrew was not essential to benefit from his discussion of the Hebrew text. He talked about how each passage fits within the canon of the Bible. I’m looking forward to other volumes in this series by Zondervan. War Room: The Legacy of Bill Belichick and the Art of Building the Perfect Team by Michael Holley. Holley has written a number of books about the New England Patriots. So far, all the ones I’ve read have been interesting. This book focuses on the staff, though it includes some material about key players and the draft process. I was glad to see that Switchfoot would be coming to Tucson for their Looking for America tour in support of the newest album. Instead of a festival show (the last time I saw them was at the Pima County Fair). I was glad to see I didn’t have a scheduling conflict to mess this up (as has frequently been the problem). In preparation for the show I wanted to become familiar with both the new album, and Reliant K. Spotify seemed to conspire against me. It appears that I needed an update, but with the horrendous sound I wasn’t going to spend much time on there. Thankfully I got the email from Switchfoot about their Live in Chicago digital release. It is a great live album, and I made sure I ordered early so I could get the live version of The Sound (John Perkins’ Blues) which is one of my favorite songs. While looking at tickets I was concerned since it said the show was from 7 pm to 1 am. This seemed unlikely unless they had a bunch of opening acts that were not disclosed. The day of the show I got a Facebook reminder, and the time was from 7-10 pm. Only 3 hours for 2 sets with a stage change in there too? I was a bit concerned. This was my first show at the Rialto. My friend noted they used to have theater seats in the back. That would have been great, particularly during the intermission. The sloped floor made standing for 3+ hours tough for this aging man. Reliant K hit the stage at about 7:35 and play until about 8:40. For me it was a long hour since I really didn’t know the songs. They sound to me like a pop-punk band. The songs were generally shorter, usually fast and not much in the way of solos (I love a good guitar solo). There were pockets of serious fans in the audience as they bounced up and down and waved their hands. While it was “lost” on me doesn’t mean it wasn’t a good show. I felt bad for the guitarists, they seemed to have a difficult time staying in tune despite frequent instrument changes. I struggled to understand the lyrics. One song I understood was about technology and the loss of presence in the moment. It was ironic with the people taking pictures and taping the show. There was an interesting one at the end of the show about dealing with girls and all those emotions. They did have plenty of energy, and props, but I thought the guitarists spent too much time with their backs to the crowd. The set mostly followed Live in Chicago with some additions (Dark Horses, Twenty-Four, When We Come Alive and Dare You to Move). The only song from Chicago they didn’t play was Hello Hurricane. It stared with Jon offstage for the first verse of Holy Water. It was a slow start to the show. Drew and Jerome didn’t quite seem engaged yet (hyper-focused?). This would change. Tim was active, as usual. I really like his bass line in Float. The new songs sounded great live. They were generally more aggressive. Drew had some longer solos on songs like Bull in a China Shop and The Sound. As usual, Jon was often down by, or in, the audience. He was body surfing during Float. The older songs, though few, held up well, particularly Meant to Live. I was disappointed there was nothing from Nothing is Sound, which in my opinion was their best album. One interesting aspect was this is the Looking for America Tour, but they didn’t play this song. Most likely this was since LeCrae was featured on the vocals. The theme really seemed to be Where the Light Shines Through, which popped up in a few other songs. While I appreciated Jon’s comments about being able to disagree with people and still remain friends, I think he went a bit far in saying “brothers”. I take that as “brothers in Christ” which may or may not be true. But people should be able to disagree about the things he mentioned and remain friends, fellow Americans (if they are) and in most cases fellow Christians. This focus is probably a big part of why The Sound is in the set. Unfortunately this mid-song musings, were not very clear. On the Live in Chicago version, they were able to make it clear. He speaks about hatred and violence breeding hatred and violence. There was a nice reference to Amos (and MLK) with justice rolling down, and then the Declaration of Independence- “we hold these truths to be self-evident”. All while Drew’s feedback rolls over the audience. It was a fun show. The songs were heavily weighted to the new album. But it was a short show (about 1 hr. 20 min). It was also a LOUD show. During Reliant K I had ear plugs in. There was a loud, distorted bass or keyboard should that frequently drowned out the guitars. There was less of that during the Switchfoot show. But I took out the ear plugs, and my ears are still ringing this afternoon. But the sound was so much better without the plugs. Switchfoot continues to put on good shows, but short shows. Much of Generous Justice to this point has been theological- why we should pursue justice as Christians. Keller moves into the more practical with the 6th chapter of his book. Taking Job 29 & Psalm 4 as a starting point- we are to give sustained, concentrated attention to the hows of justice. We won’t accidentally become just (or mature in Christ). Often it requires analyzing a situation and using wisdom to determine the best goals and means. Here Keller brings us some examples. One is of a car dealer who realized that haggling for prices tended to benefit the rich, men, and whites (who were more persistent negotiators). The people who most needed a good deal weren’t getting it because the business practice exacerbated inequalities and cultural differences. So he set fair prices without negotiation (I have negotiating, and always feel ripped off when done. I am thankful for the Christian businessmen who sold me car at fair prices.) Businesses sometimes choose the short-term over the long-term. This car dealer was choosing the long-term. He knew he was building a loyal base of customers who appreciated his more equitable system. But he also disadvantaged himself, reducing his profit per car. Justice cost him. One of last year’s more important books was on the topic of helping the poor. When Helping Hurts: How to Alleviate Poverty Without Hurting the Poor … and Yourself was written by Steve Corbett & Brian Fikkert. This is no treatise hatched in the hot house of academia. They have been engaged in developing these models on the field. They have often had to learn from their mistakes. I haven’t finished the book yet, so my comments are only with regard to the first 5 chapters of the book. The book does come with an endorsement from John Perkins who has worked in tranformational ministry for decades. He’s one of those guys shaking his head when Glenn Beck lumped everyone who talks about social justice in the same bucket. John Perkins sees a connection with redemption (we seek it as redeemed people longing to see that redemption extended to others) and the need for solid theology- not liberation theology. The book has the “dubious” distinction of being recommended by people as diverse as Ron Sider and Bryan Chappell (or Joel Belz) and Steve Childers. This means it has enough gospel in it to be Christian, and enough justice in it to get Ron Sider to buy in. It starts with the premise that much of the work going on around the world to alleviate poverty actually makes matters worse. John Perkins recognizes this with the U.S. government’s war on poverty. It left people dependent on the government. Another important premise is that most Americans (and other westerners) live as though there is nothing wrong in the Majority World. We have no grasp of how serious things can be, and think a little money can make it all better (or a concert fundraiser). We live as if not much is wrong. We don’t need to feel guilty for our wealth, but we do need to think of ourselves as stewards instead of consumers. Theologically they embrace both the individual and cosmic implications of the redeeming work of Christ. Yes, there is the forgiveness of sins. But there is much more too! Some churches (and Christians) seek to bring forgiveness but neglect the justice of the kingdom. Some people seek the justice of the kingdom without bringing the forgiveness of the king. They illustrate this from the story of a southern pastor and civil rights workers. They both got it partly right and partly wrong.